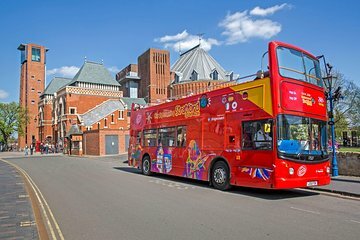 Découvrez le charmant et médiéval Stratford-Upon-Avon - lieu de naissance historique de William Shakespeare - dans le confort d'un bus à impériale à toit ouvert. Lors de cette visite touristique (disponible 24h / 24), détendez-vous lors de l'itinéraire complet ou descendez à l'un des 14 arrêts qui vous mèneront pour découvrir les principales attractions telles que le théâtre Royal Shakespeare, le cottage d'Anne Hathaway et l'église Holy Trinity. Shakespeare est enterré. Savourez de superbes vues et une histoire fascinante lors d’une visite complète (environ une heure) des principaux sites de Stratford-Upon-Avon. Profitez de la flexibilité de choisir votre propre itinéraire avec la structure d'arrêts placés de manière stratégique, de ramassages fréquents (toutes les 15 à 20 minutes) et de commentaires animés. Avec votre passe de 24 heures (valable à partir de la première utilisation), montez et descendez à l’un des 14 emplacements de l’itinéraire. Voir l'itinéraire ci-dessous pour tous les arrêts. Prenez votre temps pour parcourir l’Angleterre de Shakespeare en visitant son lieu de naissance, le Royal Shakespeare Theatre, qui joue toujours la pièce de Bard, et l’église Holy Trinity, où le dramaturge a été baptisé et réside actuellement sous une pierre tombale maudite. Faites une petite escapade hors de la ville dans le charmant Warwickshire pour visiter la maison de la mère de Shakespeare, Mary Arden. Pour terminer votre visite, descendez simplement à l’un des arrêts indiqués sur votre parcours. As usual the Hop on Hop off bus is a great way to get your bearings and hear the history as well as to help decide which highlights to visit. One day is not really enough time to see all of the Shakespeare houses.Two would be better. Unfortunately for us there was one driver sick and roadworks as well to slow things down so we had to wait nearly one hour for the next bus at one point but apart from that the tour was good. We had a 48 hour pass and started by doing the whole tour from the tourist info which helped us to get our bearings. We then had lunch and got back on to go to Mary Arden Farm as it is the furthest away. We spent two hours there and so used the bus again to visit Anne Hathaways Cottage the next day. We then used the bus to drop us back at the station when it was time to go home! This tour did not get off to a good start. As we turned up at stop No.1 for the advertised first bus at 9.30 a.m., in good time. Only to find that it was not there. I tried some emergency contact numbers, but no one knew what was going on. So we waited, and eventually, a bus arrived at 10.00 a.m., to start the days business. The driver said that there would only be one bus operating that day, instead of the usual two, and that the tours would now every hour instead of 30 mins.. Surely if they had problems, they were obliged to run the first bus at its correct time, and not leave people who had booked hanging about, not knowing what was going on. Poor Organisation, and business practice. Great sight seeing and convenient dropoff points. Brilliant tour - great audio guide, and perfect way to visit all the important properties - Anne Hathaway's Cottage, Mary Arden's Farm and then the properties in the centre of Stratford. Bought the tickets on line beforehand - and saved quite a bit. Drivers all very polite and friendly. HIGHLY RECOMMEND. I didn't go. Turns out that getting from London to Stratford-upon-Avon is not that easy. We booked the 48 hour ticket in advance and made a great saving. As we were staying out in Wilmcote, a short walk from Mary Arden's Farm, the bus service was great for us as we left the car at the B and B and used the bus to get in and out of Sratford - that in mind, it may have been better, for us at least, if it carried on a bit later into the evening. The tour itself is very informative with each passenger given a set of headphones to listen to commentary if they choose. this was the only way to get to the locations farther away--we were able to get to Anne Hathaway's house and Mary Arden's Farm with the bus. Very relaxing way to get around. Bought a two day pass before we went,if we had bought on the day it would have been more expensive.The ticket proved to be invaluable as the weather was awful.Regular and on time buses meant it was a doddle to see all the sights and spend as much or little time at each one.Drivers were extremely helpful and courteous couldn't have wished for better service.The only regret is that we didn't do the town attractions early in the day as I think that they would be less busy than in an afternoon.Also Mary Ardens farm could have done with a longer visit as there was loads to see and do.Try to be there at midday as a Tudor meal is served to the staff who give a commentary and answer questions.All in all a great experience. So glad we booked this tour. Great commentary - fun and informative. Lovely tour around the surrounding town. Recommend.